(Scott Sommerdorf | The Salt Lake Tribune) Houston Rockets guard James Harden (13) yells out a play to team mates during second half play. The Rockets beat the Jazz 100-87, Sunday, May 6, 2018. So yes, the Jazz have James Harden on their minds once again. The league’s reigning Most Valuable Player, the man who does everything, the force that cannot be stopped, returns to the scene when Utah opens its best-of-seven first-round playoff series against Rockets in Houston on Sunday. Harden’s game is both definitive and antithetical for the modern NBA, a left-handed wizard with the ball who lures in defenders, draws absurd foul calls, buries absurdly deep 3-pointers and wiggles his way into the lane with opponents seemingly glued to his hip. And he still makes it work, because only he can do what he does. Usually to the cheers of Rockets fans and to the maddening, hair-pulling, expletive-inducing ire of those who watch, always waiting for him to slip up. It doesn’t happen often. Harden is typically in control, which makes the first-round showdown with the Jazz that much more enticing. A defense-first, share-the-ball-at-all-times group in the Jazz versus the MVP who, at times, tucks the ball into his elbow alone atop the 3-point line, waiting for a weakness to expose itself. 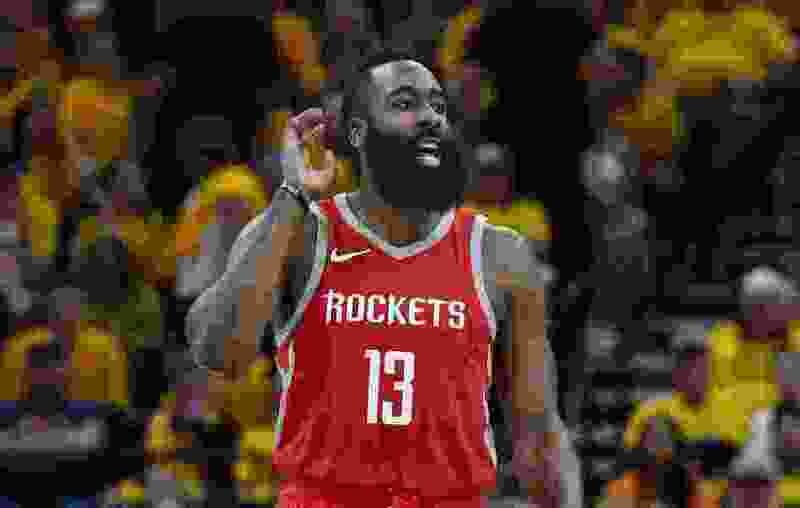 To Mitchell’s point about rhythm, when dealing with Harden, it’s about not getting stuck in the avalanche of points that the Houston superstar can generate to flip a game on its head in a matter of minutes. Harden averaged 36.1 points, 7.5 assists and 6.6 rebounds per game in the regular season. There weren’t many teams that were able to handcuff Harden, but the best team in the league this year did a swell job of making the guy who makes every opposing team uncomfortable feel his own wrath. The Milwaukee Bucks held Harden to 23 points on 9-of-26 shooting when the Rockets visited Milwaukee this season. They did it by shadowing Harden and trying to always force him right, meaning some players stood straight up to this right knowing that a big down low was waiting to help should Harden use his deceptive speed to burst by. The Bucks often picked Harden up in a full-court press, too, not giving him any sort of breather on any part of the court. Every defender had their hands up, doing their best to block his vision. Here’s the thing: Only one team in the league has Giannis Antetokounmpo. It ain’t the Jazz. The Jazz have implored that sort of defensive look at times this year with point guard Ricky Rubio, who could start off as the primary defender on Harden, waiting for Gobert to be in vicinity to help out. Rubio was not available in last year’s Western Conference semifinal series with the Rockets when Houston beat the Jazz in five games. Harden averaged 28 points, 7.4 assists and 5.2 rebounds a game in that series. After the season ended, Mitchell vowed to go back and study every regular season and postseason game from a year ago to learn entering his sophomore season. What did he glean from that Houston series in 2018? Houston isn’t the exact same team as it was a year ago, but it still has the MVP. So get ready, Jazz fans. You know what’s coming. Jab steps, step-back 3s, controversial foul calls, flailing arms, otherworldly anticipation — the best, most unique offensive player in basketball. He’s very much back in the picture. So get used to it for the next week or so. Or at least try to. Game 1 • Sunday at Houston, 7:30 p.m.
Game 2 • Wednesday at Houston, 7:30 p.m.
Game 3 • Saturday at Vivint Arena, 8:30 p.m.
Game 4 • Monday at Vivint Arena, 8:30 p.m.